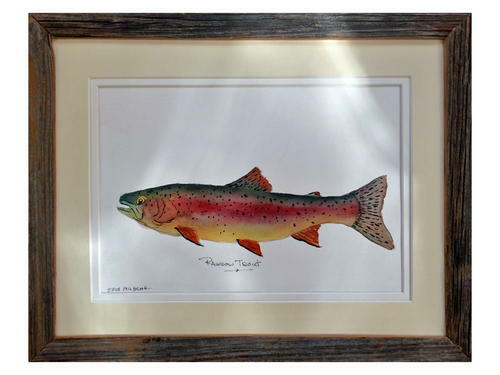 Order an original commissioned watercolor painting of your catch! The painting of your fish will be a blend of realism and impressionism. 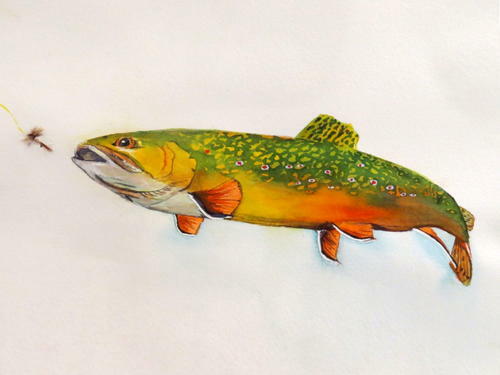 I will render a painting from your photo of your catch… the more detail the photo shows, the more I can represent the markings and color of your fish. Your fish can be painted either as an active fish jumping or swimming. We can even place a real fly in the painting. I started painting after a career as a golf professional, most of which was spent in Florida and the Northeast. My father was an avid watercolor artist. Late in life, he developed Alzheimer’s. Although I had no previous interest in painting, I started painting with him just to spend time with him and keep him active and engaged. After he passed away, I continued painting daily at our summer home in Maine and in Florida during the winter months. I am mostly self taught, learning from the study of famous artists such as Winslow Homer, Edward Hopper, and Andrew Wyeth. I have been able to develop as a watercolor artist by taking watercolor classes at the Palm Beach Art Armory and workshops with Liam Zhen, Alvaro Castagnet and Tom Lynch. I continue to study artists past and present. The more I study and learn from others, the more I am able to develop my own style. 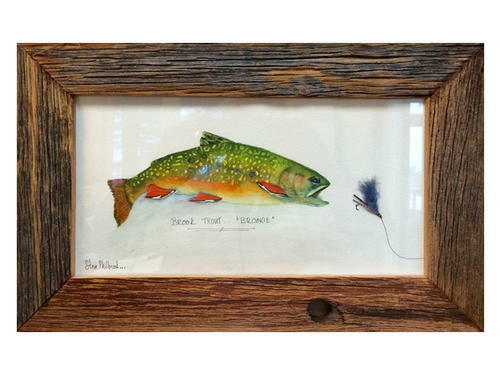 As an avid fly fisherman, many of my paintings are reflections of my passion for the outdoors and the time spent on the water fly fishing. I tie many of my own flies. 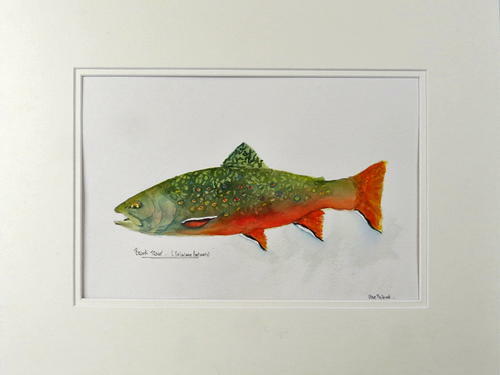 You will notice that many of my fish paintings include one of my “real flies”. Many of my framed paintings are framed in wood which I make from old barn boards and other weathered wood. I paint for the joy of painting and hopefully others will find a source of enjoyment in my work. Favorite subjects include anything that peaks my interest. I love to paint fish I have caught, birds I have seen, New England buildings and landscapes, fly fishing scenes, also, street scenes of east coast towns and cities. As a member of the Palm Beach Watercolor Society and the New England Watercolor Society, I am able to continue to grow as an artist. My paintings can be found in the Bittersweet Barn in Casco, Maine, Little Pond Gallery, Orr’s Island, Maine and in private collections all along the east coast, from Maine to Florida and in most recently in Hungary, Germany, Spain, and England. Located in The Great Smoky Mountains of North Carolina, Jim Mills and Raven Fork Rods deliver bamboo fly rods with high quality components, outstanding craftsmanship, custom design, and terrific performance that are sure to make your fly-fishing outing an exceptionally satisfying and enjoyable experience. While sound value is one of our cornerstones, we never compromise on quality. We utilize only superior components to ensure you receive a first-class bamboo rod that you will be proud to own, thrilled to fish with, and will want to pass on to future generations. We purchase bamboo rod components from manufacturers known for supplying products of select quality. Handcrafted from the finest Tonkin cane and made to mirror classic tapers made famous by rod makers of the past, our rods ship with two tips. Fashioned with ferrules of nickel silver and stainless steel guides, some of our bamboo rods are also outfitted with agate stripping guides, nickel silver winding checks and hook keepers. Raven Fork Rods are made and designed by Jim Mills, a fly fishing rod maker in the Great Smoky Mountains of North Carolina who is described in a recent magazine article as “The Rod Wizard of Raven Fork.” His vision of the perfect fly rod has been sharpened by a lifetime of fishing fJim and Bamboo Fly Rod rom salt water to clear mountain trout streams from the Madison river in Montana to the Chesapeake Bay. Because he is an avid fisherman, Jim understands better than anyone the demands of wide rivers and narrow creeks and the nuances of both dry flies and nymphs. He made his first rod in 1964 when he was stationed with the United States Public Health Service on a remote Native American reservation. Since then he has made hundreds of rods in all mediums–bamboo, fiberglass, and graphite. He has also painstakingly restored rods of all kinds including broken beloved poles and family heirlooms. More recently he has come to specialize in bamboo, which he believes is the Cadillac of the industry. Along the way, he was fortunate to study and be mentored by a veteran bamboo rodmaker who challenged him and helped him master this difficult medium as is evidenced by the outstanding quality of his rods.